Mordian 7th Regiment: Inq28 - Eisenhorn and friends! Late last year I rolled the dice on ordering some models from an Etsy shop called Artel W. Miniatures that caught my fancy. Generally speaking I wasn't expecting too much being the first time ordering from a tiny caster in the Russian federation so I was prepared to be disappointed. Turns out in the end I was not! First off, the miniatures did take nearly six weeks to arrive which is on the long side for these sorts of products, but not completely out of the ordinary, and to be fair there was the Christmas and New Years in there. 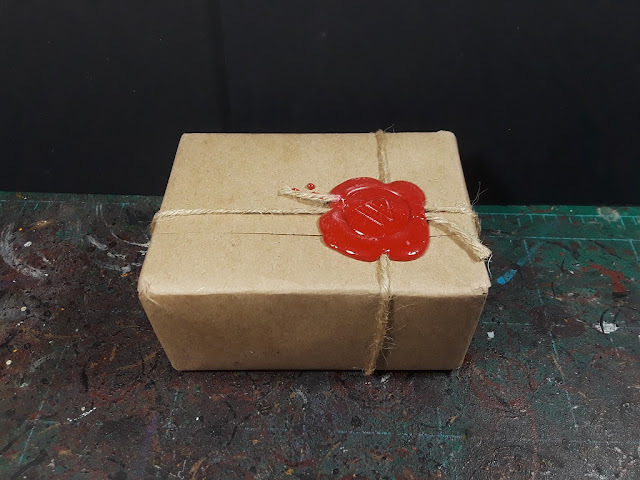 Once the package arrived I was eager to get stuck in but was greeted by a rather cool surprise inside the shipping envelope - the box was wrapped in parchment, bound in twine and sealed with a rather cool wax seal. I have to say I was rather charmed by that little extra detail! Rather eagerly I set to building the models - They came with plastic bases but thought they deserved some more interesting resin bases. 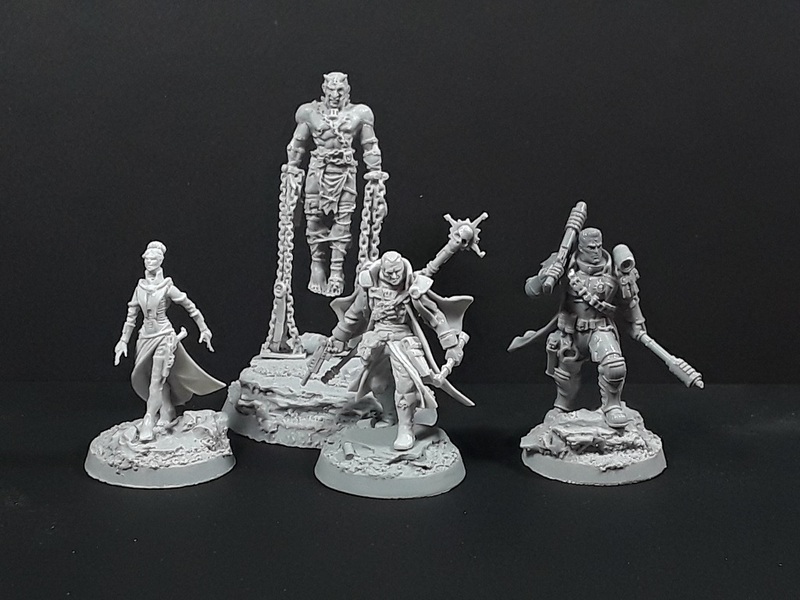 The models that caught my eye initially were totally-not Inquisitor Gregor Eisenhorn, the psychic blank Alizebeth Bequin, Chastener Godwyn Fischig and the Daemonhost Cherubael. Holy moly are the models fiddly, but really dig how they came together! 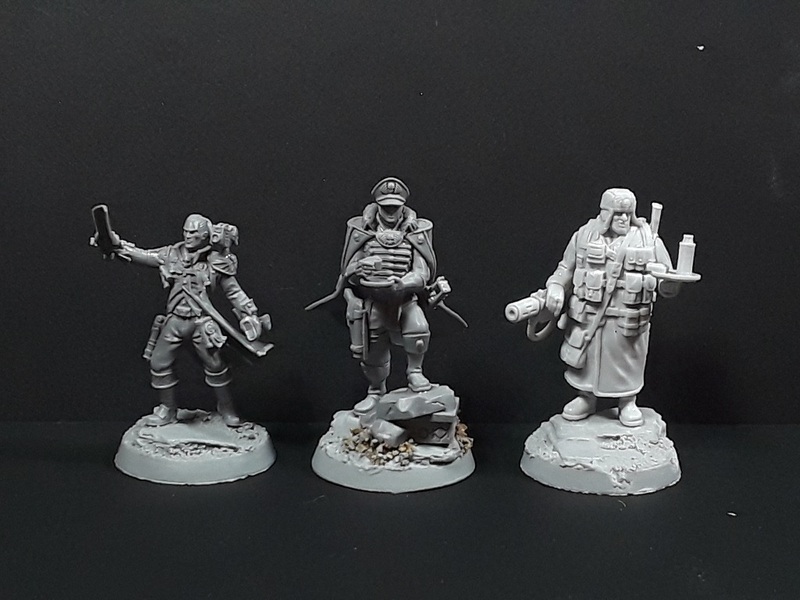 The second batch of models that I couldn't pass up included Inquisitor Covenant, Commissar Ciaphas Cain (Hero of the Imperium), and his loyal dogsbody Jurgen - Interestingly, also a Pariah like Bequin (albeit far more fragrant). Since I placed the order they've released several other new models that I plan on ordering. While the shipping was long, the sculpts are beautiful and I look forward to painting them up! Okay, I’m envious. Those are beautiful models. I am rather impressed with 'em as well, will definitely be doing another order in the future! Nice. I've got a Fischig on the way as well, so I'm pleased to see your cast looks good. One mild nitpick; that's not Covenant, it's Gideon Ravenor (pre-Chair, obviously). badass, although really? no amberly veil? Hah! I'm hoping to see more characters out of these folks, for sure! Those are some seriously tasty looking models, the Eisenhorn sculpt especially! Fischig looks very cool too! Indeed! It was the Eisenhorn model that initially caught my eye! These look really good, can’t wait to see them painted. How do they compare size-wise against recent GW releases, especially Necromunda gangs? Cheers! They are pretty well scaled, though a couple models are perhaps a little smaller/more lithe. I'll be sure to grab a couple GW minis to compare in upcoming pics! If you don't mind the wait, I would recommend giving them a try - I'll be ordering again at some point soon! Awesome! Looking forward to seeing 'em! Impressive miniatures, fancy some tanna sir? Whats the scale on cain and jurgen? I've heard that they are super tall. They are pretty tall, I didn't do 'em any favors by putting them on tall resin bases as well! I'd say they're taller than a guardsman, shorter than a primaris marine. They both comfortably fit on a 25mm base. I thought the "covenant" figure is a young, pre-Thracian disaster Ravenor, based on having a psycannon and the sword, as well as looking like the common image for him - http://wh40k.lexicanum.com/mediawiki/images/2/22/RavenorPreChair.jpg. But he could be a Covenant too, of course! That's a good point, and I think you're absolutely correct! I had just read the recent Inquisition Wars novel so had Covenant on the brain, but it makes a lot more sense that it'd be Ravenor, what with all the other Eisenhorn-era models. After I ordered these models, they came out with one they're calling "Distaff" which leads me to believe the one I have is supposed to be Patience Kys, as well. Good catch! I am dithering on ordering the Distaff and Savant figures, but ordered Gregor, chastener and daemonhost before they vanished, in part because of your review - thanks! Kicking myself for not getting Ravenor though!